Property Details: 1 Bedroom, 2 Bathroom Home with approx. 895 square feet. 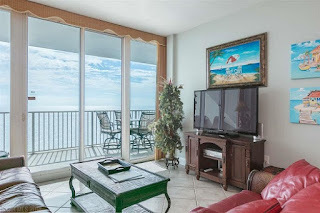 Lighthouse condo for sale in Gulf Shores-Orange Beach-Perdido Key. An absolutely beautiful Condo with stunning views and wonderful decor. One bedroom unit that features an extra bunk room puts rental numbers over the top, making this condominium the perfect investment. The fantastic views from this perfect height on the 11th floor are hard to beat. Beautifully decorated including granite countertops and tile flooring. Lighthouse is one of the most desired complexes on the beach for both location and rental income.